Be the first to share your favorite memory, photo or story of Violet . This memorial page is dedicated for family, friends and future generations to celebrate the life of their loved one. 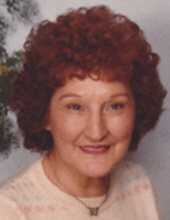 SUMMITVILLE- Violet M. (Bright) Jenny, 95, Summitville passed away at her residence on Monday, January 14, 2019 following an extended illness. She was born on January 2, 1924 in Summitville to Fred and Grace (Friend) Bright and has lived in the Summitville area for most of her lifetime. Even though she graduated from Anderson High School-Class of 1942, she had attended Summitville schools and was always a “Goblin” at heart. Violet had worked at Jenny’s Grocery in Coggletown for some time. She retired from F.W. Woolworth Company in Anderson and Castleton after 20 years of employment. She was a member and Past Worthy Matron of the former Summitville Order of the Eastern Star. She enjoyed camping, playing Skip-Bo, gardening and time she spent with her grandkids. Services honoring Violet’s life and legacy will take place at 1 pm on Friday, January 18, 2019 in the Owens-Noffze Funeral Home, 1009 West Walnut Street, Summitville with Brian Wise officiating. Interment will follow in Vinson Memorial Cemetery at Summitville. Friends may call at the Owens-Noffze Funeral Home on Friday after 11 am prior to the service. Memorial contributions are suggested to the Summitville United Methodist Church through the funeral home. To send flowers or a remembrance gift to the family of Violet M. Jenny, please visit our Tribute Store. "Email Address" would like to share the life celebration of Violet M. Jenny. Click on the "link" to go to share a favorite memory or leave a condolence message for the family.